The World's #1 Largest Inflatable Waterpark - Book Online Today! Unforgettable birthdays with friends and family. Challenging games to test your might. Fun for all students and teachers. Direct access to JBR Beach. Lock your valuable aways free. Team build with your teams with heaps of fun! I got tickets for my fiances birthday and he and his cousin had so much fun. Since it was a gift, I had several questions after purchasing it and Ahmed Ben Chaibah was great at responding back to my questions quickly and I felt at ease with everything. Thanks for creating something so fun in Dubai for all to enjoy. Absolutely Fantastic time had by my family. Great fun! We had so much fun last Friday aqua fun love it much !!!! I don't care the hot weather how many degrees as long as full of fun and exciting ever! Aquafun is the world’s largest inflatable water park located in Dubai Marina. We have over 70+ obstacles for fun with all your friends and family. 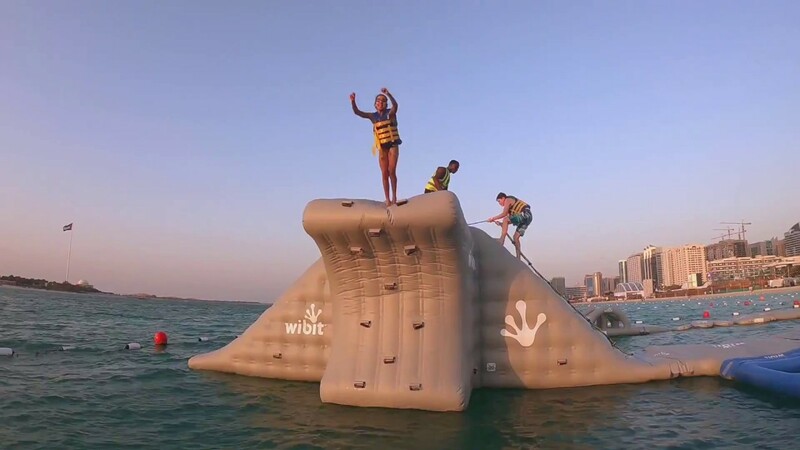 The aqua park spans along the JBR shore, filled with unrivaled fun. With our ever-growing demand in Abu Dhabi, we have opened our new Abu Dhabi aqua park located on the corniche. This is the first of it’s kind in the capital of the UAE, situated in one of the busiest and vibrant parts of the city. The minimum age for entering the park is 6 years old. Do both Parks have the same Price? Both parks have separate pricing, you can view ticket pricing here. Yes, Aquafun is a popular tourist attraction all year round, it is advisable to book in advance. Yes, there are showers located nearby for you to use. Do you offer Birthday offers? Yes, we have special rates for schools. Please get in touch so we can assist you further. When is it Most Busy?